Eminent brings its HD Media Player to the UK | What Hi-Fi? It can accept your own choice of 3.5in SATA HDD – 'up to 1.5TB or larger' the company says! – has twin USB ports for memory sticks or hard-drives, and can either be connected to a computer via USB or on a network. 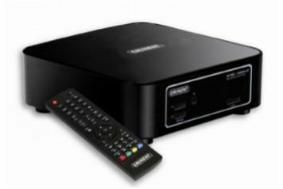 It supports streaming of both music and video at up to 1080P, has HDMI 1.3, component video, stereo analogue and optical/electrical digital outputs, and is on sale now at Amazon.